Holy books like the Bible can help people, especially Christians, engage themselves with the almighty God. With the advent of e-books, people are able to lay aside the thick paper Bible books. There are many Bible apps available on iPhone and iPad today for reading the Bible more conveniently and quickly. 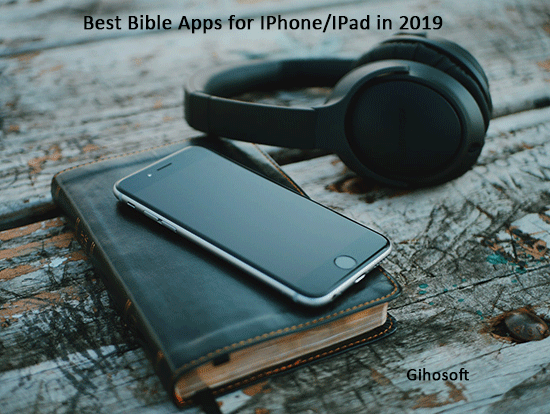 Here we sort out 11 best bible apps for iPhone users to read the Bible handily and find your inner peace, based on different parameters such as popularity, ease of reading, offline compatibility, night mode, translation relevancy sharing option and so on. We also provide the App store links of best bible apps so that you can easily download them to your iPhone or iPad and get them started. This is the best bible app for iPhone or iPad users to have in their devices with a rating of 4.9 on app store. YouVersion is owned by Life.Church, which is one of the largest, fastest growing and most innovative churches in America. This app is designed so user-friendly that any user can easily read bible in his/her iPhone or iPad. The most interesting part of this app is that you can let audio version read the Bible to you. If you prefer reading the Bible rather than listening to audio notes, there are varieties of different fonts available on this app. You can choose your favorite font to make it compatible for you to read all the things. That’s why this app has been conferred with so many great awards by religious organizations. The voice listening feature of this app is definitely what makes it a wonderful choice for the iPhone or iPad users. You can easily listen to the voice translation of Bible and other books line by line to understand them in a better way. Over 1000 different languages along with offline backup of different books is another attractive feature of this app which cannot be ignored. You can download Bible. Is app absolutely for free from the App store through the link provided below. This is another very well-known free Bible app for iPhone/iPad, developed by the developers of HarperCollins now. This app has a rating of 4.8 on app store and users over 95.3K. It is one of the most popular Bible iOS apps which provide both compatibility and suitability to the users. Bible+ is surely a great choice for the users who love to make notes while reading the texts or novels. Most of books are free to access and read, but some of them can be accessed only by making an in-app purchase. You can also translate the book into your native language if you want as there are lots of different languages supported by Bible+. We hope that you will like all the features available. When you are looking for the best Bible apps for iPhone/iPad, you will definitely find Logos is one of the most brilliant choices for iPhone users with a rating of 4.8 on App store. The feature of group sharing is what sets this app apart from others. Many great and serious biblical e-Books are only available on the the Logos platform. This app is free for all users and you can download this application through the link provided below if you want to do deep word studies or any other type of research. Faithlife Study Bible is a very good choice for iPhone users just like YouVersion and Logos. This bible app will surely provide you with the best optimized features to enhance your reading experience. The main advantage of using Faithlife Study Bible app is that you can download the e-books you select to your iPhone or iPad so that you can read that book even when you are offline. You can also switch to the “up-gradable plans” mode of this app if you want to read some more holy books. The cost of “up-gradable plans” starts from a minimum of $10 to a maximum of $50. You can easily purchase your favorite books and read them efficiently. Accordance is another very great option for iPhone and iPad users because its simple usage and good index can help users to read the Bible in the most effective manner. You can add personal notes to any verse reference. And like logos, this app also supports group sharing. This app doesn’t occupy much space in your device once you install it through the provided link. The developers are working hard to make this app comparable with its strongest competitor- Logos. And we really expect that more exciting features will be added to this app. This is an elegant and radically simplified Bible app for iPhone and iPad, having a rating of 4.7 on app store. You need pay $4.99 to download NeuBible app but it is worthy. This awesome app provides beautiful and considered reading experience, which makes iPhone users cannot help reading Bible through it. The NeuBible is a recently launched app on app store so its users are not as many as those of other Bible apps. But one thing is for sure that NeuBible will really make your day if you read the Bible on it. The Bible is available in up to 9 different languages translations on this app. Though it doesn’t support note making feature, most of the other features will surely attract you to install this Bible app on your iPhone or iPad. This bible app will surely unlock the door between you and the God. It contains one of the largest databases of different e-Books which will make your day. Bible Gateway is considered as an excellent choice for all iPhone and iPad users because it supports multiple features like offline compatibility, language translator, audio translation, etc. This app needs to be improved so that it can be made compatible with all type of iOS versions including iOS 12. ESV Bible app is quite popular among iPhone users because of the incredible features it offers. This app is designed with beautiful interface and decent typography. It possesses free resources such as interactive reading plans, audio stream, and free access to the ESV Global Study Bible. Split-screen reading, quick access to cross-references and an innovative reader’s mode make it easy to establish a connection with the God on a deeper level. This app may be not perfect enough but it is being optimized all the time. The features of personal notes, offline compatibility and lightning searching speed presented in this app surely make ESV Bible a quite worthy choice for iPhone and iPad users. The He Reads Truth and She Reads Truth apps are very proper apps for the users who want to access and read the best qualified books of their choices. Most of the e-Books presented in this app can be translated into 6 different languages, which is surely for your interest if you don’t understand the original language in which the book is written. Some books are also available for offline reading, but you need to register on this app to create offline backup. This app was once developed for the private use of a particular organization. But soon after its huge success, it was launched on app store where it has attracted more genuine users. People can share with different groups on this bible app, for example, they can share the journals, devotes messages and much more with . This app is a very suitable choice for those who are visually retarded and unable to read the content because this app comes with audio translation in many different languages. That’s why users are heartily recommended to install this bible app in their iPhone or iPad. All above are the best bible apps we list for all iPhone/iPad users. They have many similar features but each of them has its unique functions too. It’s their unique functions that allow you to pick up the best bible app you really need. We sincerely hope you can find your favorite bible app through reading this article. If you have discovered any other gorgeous bible apps for iPhone or iPad when browsing app store, please share them with us. And we also appreciate any of your comments.